Sorry for the break in blogging, there has been no particular reason for it. I have found it difficult of late to write and with my riding in particular there has been a bit of a low point last weekend where I felt nearly ready to throw in the towel and accept that I just shouldn’t be a rider. I am feeling much more positive about it now and even the hours afterwards I picked myself up and decided that the negative, dwelling on the lows didn’t seem to be getting rid of my nerves so perhaps I just need to not focus too much upon it. So enough of talking about that, I will say that my corner of Scotland managed to experience some beautiful weather last week which lasted until ooh 5pm on the Friday and greeted us with hail, snow and wind on the hack. The sky was almost black as my fellow hackers cantered back up the beach towards us, it looked dramatic but the downpour that followed simply left us soaking. But the amazing Scottish weather (seriously Londoners stop posting Instagram pictures of ice cream – I am a country lass through and through but the sunshine adventures people are photographing almost makes me think of upping sticks) hasn’t put me off my latest challenge. I am doing #30daysofbiking. I am cycling each day in April – so far, so good. I have bizarrely managed to sprain a tendon in my big toe so my foot-down-waiting-at-lights position is a little odd but it has been fun. I have tried cycling in a skirt, I definitely need leggings or these awesome bike bloomers. Cadfael (yup I named my bike after a crime solving monk) has a straight cross bar so getting on and off in a skirt was quite interesting. I may need to invest in the penny in yo pants solution. Oh and did I mention that skirt is the one I made myself!! I will do a proper sewing post soon but safe to say this skirt has already been worn loads and proved itself a suitable piece of bike attire. 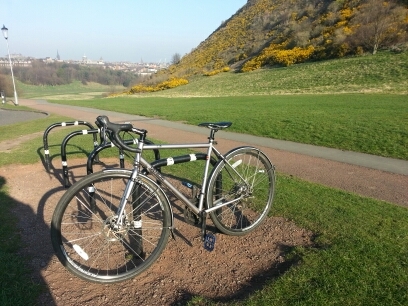 I have been pushing myself a little further to try and improve my fitness, I have a longer bike ride planned with the awesome Belles on Bikes – a cycle group I ride with in Edinburgh – on Saturday and then another on Wednesday. My cycle buddy Leisa and I are starting our longer morning cycles again and I hope to be able to squeeze in an after work meander with her but she is super busy. This challenge is proving fun, as yet it hasn’t been too difficult for me to shoehorn cycling into my everyday life but I have noticed that without the amount of walking I usually do my general activity levels are lower. I guess getting home faster then sitting on my arse all night probably isn’t the way to long term health! Next Next post: Fashion Revolution Time!